So let’s start from the beginning. 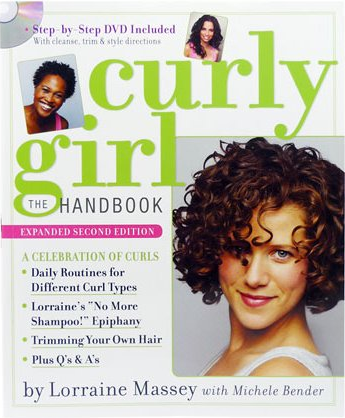 Purchasing Curly Girl, by Lorraine Massey, owner of Devachan Salon and Spa in New York City, was the first step to my hair’s liberation, and a lot of what I will talk about in this blog will refer to the book. I will give my opinion on the treatments, things I’ve learned that improves upon them, and explain why certain approaches don’t work for me. The problem with hair is that everyone’s is different, so one blanket approach doesn’t necessarily work for all. There are, though, some basic rules that will almost always apply, and that is what I’ll cover in this first post. 1. Throw out the shampoo! I mean it, I have not used shampoo in 7 years and my hair has never been better. Shampoo contains detergents (sodium laureth sulfate, other sulfates) and alcohol. Curly hair strands are more porous than straight hair, meaning that they absorb everything around them at a higher percentage than straight. This explains why in humid weather our hair puffs up–it is absorbing the water vapors (this will especially apply when you’ve stripped your hair of all of its protective oils by using harsh shampoos). One way to counterbalance this is to leave extra conditioner in your hair so it is already at it’s maximum absorption level, but I’ll get into that later. 2. You have to be serious. I know that sounds silly and obvious, but your scalp will itch insanely for the first 3-4 weeks. That sounds like a really long time, but you only have to do this once in your life. The reason it itches is because your scalp is actually healing, and the amount of sebum (oil) that your scalp produces is still in over-drive because of its years of having to produce at a higher rate due to sebum-stripping detergents soaking into your hair and scalp every time you wash it. Two things will happen when you stop using shampoo: Your scalp will begin healing (think of it like a scab, things itch when they’re recouperating) and your sebum production will begin to slow down. 3. During this “healing” time and afterwards, there are still ways to clean your hair. Every time I shower, I scrub my scalp with conditioner. You know how great it feels when they massage your head while you’re getting a wash at the hair salon? Think of it that way. You’re using your fingertips (coated in generous amounts of conditioner) to massage out any product build-up and extra oils. When you’re in the itchy stage you’ll probably want to do this every day, and go ahead. Massage your scalp for as long as your little heart desires! But do NOT succumb to shampoo! Yes your hair will feel and look greasy, yes you may scratch so much that people around you might think you have lice, but remember–IT’S ONLY 3 WEEKS OUT OF YOUR LIFE. I can never stress this enough. I’ve seen so many women stop doing this during the initial shampoo-weaning process, and it’s a shame. Another great cleanser is the lemon-conditioner duo. This recipe from Curly Girl is simple, and I explain how to do it on the Oil Treatment page. 4. The book says you shouldn’t wear your hair up too often. I think that’s nonsense. If I’m having “a day” and don’t want to deal with my hair, I put it up. When your hair is greasy and gross during your first month, you’ll probably want to wear it up most of the time. That’s fine. It’s best to use hair elastics without the little metal bar, though. We do not want to pull any more of our hair out than necessary, we already typically lose hundreds more hairs a day than straight-haired people do. 5. The book also says never to straighten your hair. I’m only covering this in the beginning because I don’t want to scare people off. No, you shouldn’t do it too often, but by all means you can still do it. Once a month is probably still fine, but even then I’m sure not to use the iron more than twice (ie: You straighten your hair with the blow dryer on Tuesday, use the iron immediately afterwards, and then you can use it to freshen up again on Wednesday, but I wouldn’t use it much more than that until the following month). One hair stylist at Devachan, my go-to curly hair salon, told me that it’s actually sort of good to do this now and then, as it loosens up your curls and allows you to assess split ends and damage more easily. I never bother doing this in the summer or in any kind of humid weather, but I definitely straighten a few times in the fall and winter. (Note: You will be shocked and amazed by how gorgeous your hair will look straight after you’ve been babying it like this). Summer is the best time for hair rehab, but that doesn’t mean to wait to start. Just imagine how gorgeous and frizz-free it’ll be by the summer if you start now! I am new to curly girl and I almost gave up do to the itchy scalp. I even ( gasp) returned to the darkside and used a sulfate! What a disaster that was, made the scalp worse! So now I’m back on track and just waiting for it all to settle down. A big thank you to you because you are one of the few who mention the scalp issues! I thought I was going crazy! Have a great wedding and congrats!